After posting earlier this week about the Lenawee County Railroad (LCRC) at Grosvenor, MI, I ran across this photo, taken 4 days earlier—on 04 December 1982. Here the Conrail local, led by GP15-1 #1638, is returning to Toledo, OH from Lenawee Junction, MI. In tow are a single covered hopper and an ex-PRR caboose. The line onward from Lenawee Junction to Clinton had been embargoed in March of this year, so from that point out the only Conrail traffic was the occasional Lenawee Junction turn. The equipment was most unusual for this line. It was my first spotting of a GP15 up here (GP-7s or switchers were the norm) and the first time I’d seen an ex-PRR caboose (normally we’d see ex-NH NE-6s, ex-NYC bay window cars, or transfer cabooses). The murky day sets the appropriate tone—this was the last Conrail train I ever photographed in Lenawee County. 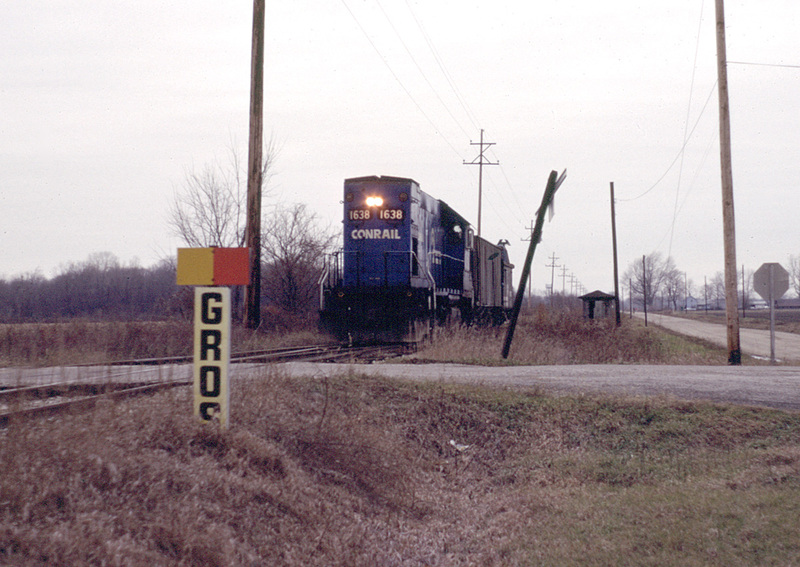 By the end of the year, Conrail was gone, and the line from Lenawee Junction to Riga, MI had been purchased by the state, and was turned over for operation by the LCRC.